Today, when the era of crypto speculations is obviously ending, blockchain is no more a matter of faith. I do not consider it an insult, but rather a compliment to be called an agnostic. I do not pretend to know where many ignorant men are sure, that’s all that agnosticism means. Agnosticism is a philosophy that is based on simple observation of the world. It relies on direct evidence and logic. Agnostics question statements which people are used believing. The term agnosticism in blockchain context has a specific meaning. Let’s start with the quiz. 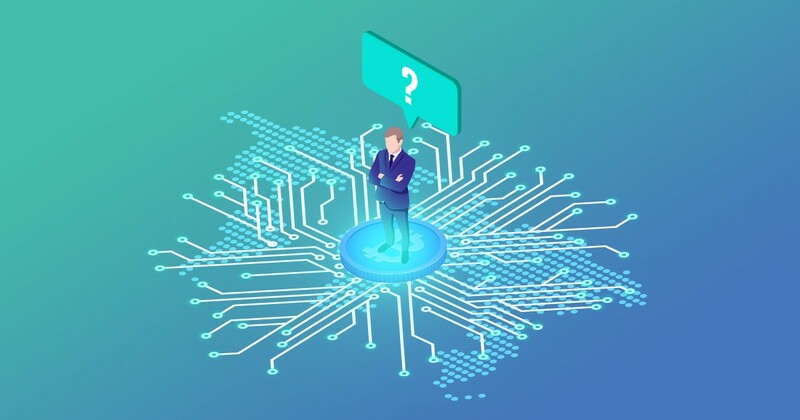 What is blockchain agnosticism? The most complete answer is the last one, but all listed statements are connected with the concept. The first time we heard about blockchain agnosticism from our partner Andrew Rippon. His UAE based company, Thrupny, specializes in practical usage of blockchain in such industries as real estate, government, procurement, and logistics. Most enterprise clients are attracted with transparency, tokenization, smart contracts and other benefits of blockchain ideology and technology in general. Then they wonder what could be the measurable use case for blockchain in their companies. Thrupny has a strong record of finding the solution based on its research and experience. For instance, in real estate, Thrupny knows how to reduce 50% of targeted administrative cost in incremental steps from three months to two years implementing blockchain. The next part of the conversation is the most challenging. Andrew integrates blockchain in existing businesses which consider risks very carefully. Blockchain, or rather the whole range of distributed ledgers including DAG, is complicated technology. There is a wide range of consensus algorithms, smart contract languages, virtual machines, Software Development Kits, data storage concepts. Most of these are far from the daily IT department experience. Many questions arise. The transaction speed and throughput are not the first of them. Businesses want to know which blockchain is suitable for their use case. What if they make a wrong choice or their needs will change during the time? What will happen if the community stops to support the blockchain? What if a company’s partners or ecosystem uses a different blockchain? Or multiple blockchains? Even more basic concerns arise, mostly driven by the notoriety of the rise and stall of Bitcoin and how that relates to the data that companies could potentially place on blockchain. Flexibility is the feature which mitigates risks. Businesses can accept blockchain in their environment even knowing that the technology is changing fast if they are financially protected from the consequences. Existing businesses want the benefits from technologies like smart contracts which seamlessly work with infrastructure that has a long term future, in this case blockchain ledgers. They want their use cases to retain the targeted features and interaction with the blockchain ecosystem as designed even when the market moves to different protocols. For example, in a financial based use case, that tokens stay liquid despite the initially chosen blockchain becoming superseded in the market. To help their clients with those concerns, Thrupny partnered with us. EVEN is a universal cross-chain solution. Other projects that claim to be interoperable systems solve only particular problems. We have studied them for this post and have found no complete solution that can provide seamless cross-chain experience to a user of any blockchain. EVEN has a unique and market leading solution for this. That’s a pretty bold statement. Let’s prove it. How exactly does the EVEN cross-chain mechanism work? EVEN’s cross-chain solution is a decentralized system that is supported by blockchain node owners. To work with diverse blockchain protocols, EVEN use a distributed storage and management of digital assets from various external blockchains, that provides cross-chain exchange operations for digital assets. Every participant of the network can facilitate cross-chain operations if they also run the node of the external blockchain. These participants can be compared to a network of centralized cryptocurrency exchanges, each of which supports one or more specialized (native) wallets on different blockchains, and performs cross-chain operations according to a standardized set of rules. The unique algorithm developed by the EVEN Foundation team automatically secures every transaction. Its basic mechanism is the deposit, which ensures that network nodes will function correctly in accordance with the rules. When the node receives tokens to perform a cross-chain transaction, the corresponding amount in EVEN tokens will be blocked on its account until obligations are fulfilled. If the event rules are violated — for example, funds are intercepted by the node or a third party — the affected network participant is automatically reimbursed from the deposit at the protocol level. The mechanism works automatically and autonomously for any asset and blockchain. Currently, if developers want to move distributed applications (dApps), which are built with blockchain smart contracts,from the Ethereum blockchain to the EOS one, they have to rebuild the application. The consequent two dApps will work separately and can’t exchange data. The core purpose of the EVEN Network is to support interaction with external blockchain platforms. That means that it will be possible to manage not just transactions, but also smart contracts in other blockchain networks. Cross-chain smart contracts will define the request hierarchy and conditions governing the execution of smart contracts in various blockchain platforms, acting as a router. This technology will open a unified and integrated platform for any dApp, therefore future proofing investments in blockchain technology. There is another fundamental reason for the importance of a cross blockchain capability. Interoperability in the blockchain industry is a key to its mass adoption. Only crypto enthusiast have their favorite tokens and dApps. Companies and individuals in the real world are blockchain agnostics and they need a simple, friendly and secure solution with no limits. The tangle of thousands of blockchains is like that of network wires: the solution is to keep them in the rack. EVEN helps developers to streamline tools, frameworks, and platforms. As a result, they can focus on building dApss, enterprise solutions, and offering exciting experience to their users. The EVEN open source platform goes live soon. Keep in touch, follow us on GitHub. This story is published in The Startup, Medium’s largest entrepreneurship publication followed by +441,678 people.